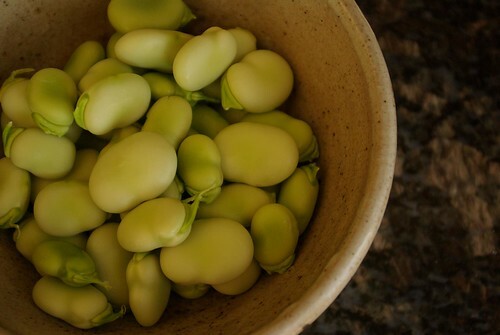 We finally got to the farmer’s market early enough last week to get hold of some fava beans. They tend to sell out fast, given that you really need to buy at least a pound or two to have enough worth eating. I don’t often feel like spending the time to shell and peel fava beans, but I like to make sure we have them at least once a year. When we first started getting favas (always from the same person, Debbie of Colony Creek Farm), I knew one way to fix them: blanched, peeled and sauteed with green onion, prosciutto and some cream, then tossed with pasta. Delicious, indeed, but we actually managed to burn out on the flavor. I wanted to try something different, and we just happened to pick up a fresh bunch of garlic scapes at the same market, which made me think Pesto. Then, and I know this isn’t always called for, but it makes it much easier: I heat up a saucepan of water, and when it boils, drop the beans in for just a minute. Then I drain them, run cold water over, and then slip the beans out of their skins. 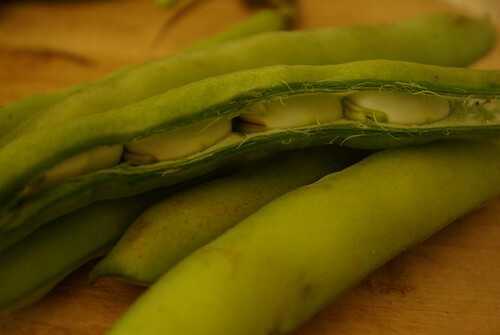 All that’s needed is a fingernail to slit the skin at one end of the bean, then you just squeeze from the other end and the little green bean comes shooting out – hopefully your aim is good, I’ve been known to shoot favas all over the kitchen. When you’re done with that, you have a very small bowl of bright green favas (this particular bowlful started as one and a half pounds of beans in their shells). We may have gone a little overboard on the parmesan cheese, but it worked out fine. These garlic scapes seemed a bit more potent than the ones from our garden, though – good thing we weren’t going out in public afterwards! 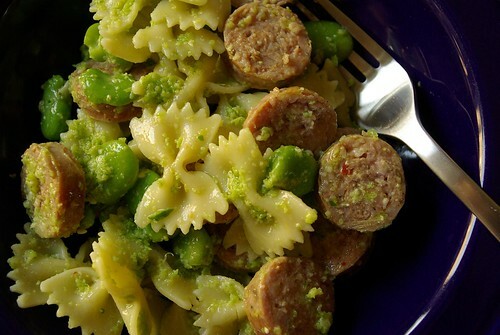 The beans, pesto and sausages all got mixed into the hot pasta and we scarfed it all down. Simple but tasty! 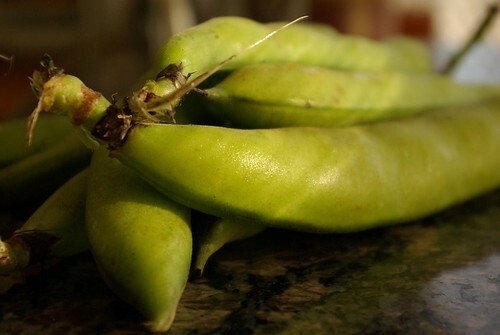 Nice photos of the favas; nice description of peeling them. There was a recent article in the Seattle PI where a farmer actually said you didn’t really need to peel the inner skin if they were fresh. I had to disagree. 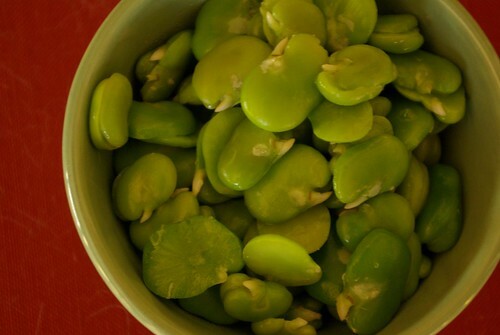 Though I know some folks in MV who come from Michoacan, love favas, but never bother with the peeling. They make a dish that features favas, shelled peas, cactus leaves, and hot peppers. We were treated to some once and it was good, but I thought it would have been better if they peeled the favas (of course I didn’t say that!). I know some people say you don’t need to peel the beans, but no matter how fresh they are they always seem kind of bitter and fibrous. I’d rather spend the extra few minutes peeling. 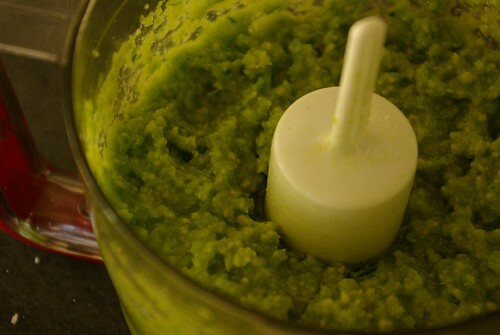 The dish with favas and cactus sounds cool – do you have a recipe? Sorry I don’t have a recipe for you. Next post- your own tomatoes already! We’re on the SAT studio tour this weekend if you are out and about our way.